Nasser Rahmaninejad, a foremost celebrated Iranian artist started his theatre career in 1959 in Iran. In response to the authoritarian cultural policies and harsh censorship of the Shah’s regime, he founded his alternative, independent theatre group, Mehr, in 1966. His group, which later changed its name to Iran Theatre Association, became very influential in the field, competing with other well-financed, state-sponsored theatre groups until it was closed down by the SAVAK, the Shah’s secret police in 1974. All members of the group were arrested and Rahmaninejad was sentenced to 12 years in prison; though he was ultimately freed by the 1979 revolution that toppled the Shah’s regime. After the revolution Rahmaninejad resumed his artistic activities, staging several plays while teaching at Iran’s Faculty of Dramatic Arts, while writing articles and lecturing on theatre and politics for a range of audiences. Following the Islamic regime’s crackdown on the opposition, Rahmaninejad was forced into exile. 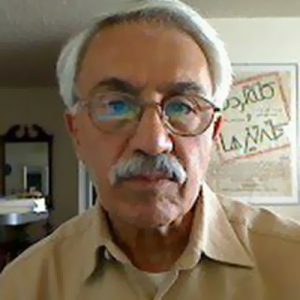 However, he continued his artistic activities writing essays, translating articles on theatre and politics into Persian, and lecturing at a variety of academic and artistic organizations in Europe and the United States, such as the International Writing Program (University of Iowa), the Center for Iranian Research and Analysis (CIRA), and the Iranian Studies Program at Stanford University. His plays in exile include My Heart, My Homeland, produced and performed by the Department of Theatre of Columbia College of Chicago (1995); and One Page of Exile, performed in the inaugural “New Windows on Old Pasadena” festival (1996). Rahmaninejad lives in the Bay Area, California.